Reggie Lauderdale suffers from a crisis of faith. His cousin, Elmer Mott, dreams of becoming their hometown mayor. Both boys are stuck in suburbia trying to be adults… but they aren’t sure how to be themselves yet. When a twist of fate sends them fleeing in a stolen limousine, the cousins escape to Florida where they meet a retired televangelist, who inspires them on a path of glitzy sermons and late night parties. But are the celebrations sincere or deceptive? And who is keeping tabs? Who is watching? 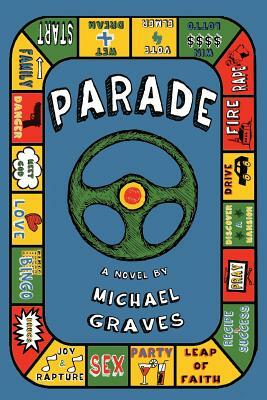 Parade is a tour-de-force comic tale of religion and government.